Whenever the Corp purges virus counters, he or she loses 2credit, if able. One of the least sought after rounds for a corp player is the one where he has to spend the entirety of his turn to negate virus counters. Effectively giving the runner 2 consequtive turns to catch up/gain an advantage whilst doing nothing. So you better make sure there is a lot of counters on the table when you do wipe them. For the runner, having your counters wiped is a boon and a curse. An extra round is good, but if the corp is in a good position it is very bad to have lost some of your power. If the corp wants to get to that point where wiping counters feels like a natural move the corp has to set himself up economically and with board presence enough to continue full strength when he finally gets his next turn, if the corp player is forced to wipe when his position and/or economy is bad he puts himself at an even greater disadvantage than he is already putting himself in by "forfeiting" a round. This card lets you create that extreemely bad circumstance artificially. 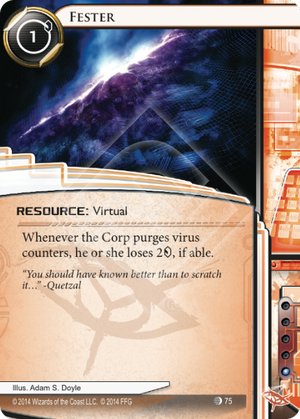 Generally a virus heavy deck might get viped once or twice a game, three times if things get extreeme or if the corp gets a large advantage, so this card HAS to come into play before then to be effective. This makes Fester a two or three of include card. it will only work in a deck with a lot of virus counters and even then only when the corp wipes them. Assuming that the corp wipes twice in a game one of these guys will cost them 4 at a cost of 1 to you, a net benefit of 3 per wipe. Many copies of this card in play at once stack, so if the corp wipes twice with two of these out you cost them 6 or 9 with 3 out. Assuming you force the corp to wipe at least twice, the numbers then climb higher if they must wipe more often then that. This card is basically a reverse Beanstalk Royalties, or a reverse Restructure if they wipe 3 times, and so on. The corp has two answers to not take this huge loss in tempo. Not wipe or wipe when they are at 0 credits. Forfeiting turns when your total is 0 or when it would be reduced to 0 is nearly as good as them forfeiting the game, depending on how lucky you will be with your upcoming runs on badly protected servers. The other option, not wipe, is probably the better one, but still a sour apple for the corp. The corp does not want you to have 3 or 4 counters on 3 or 4 different copies of Medium and/or Nerve Agent, they want to wipe it, but at the cost of an entire round and 2-6 they just cant do it unless they somehow get a huge advantage. This card is a Ciminal card painted red. It does what you normally expect from criminals, mess with the corp's economy forcing them into bad play's. If you want to splash blue into red or vice versa consider this as an element of war against the corp, build those virus counters and play this when they dont expect it, make them choose between their and your multi-access. If this card has a disadvantage, it is low priority. Why would you "potentially" cost the Corp some credits, when you could just as easily include cards that gain you the same amount or more streamlined cards for more dramatic effect? Streamlined as in Account Siphon.